When I first got this Mod, I liked the design of it. It’s as simple as it comes and reminded me of a taller version of the hog V3 mech mod. It’s a simple rectangle mod made to accomodate 41mm atomizers like their Titan 41mm RTA. Outside of that it’s as simple as they come and kind of reminds be of a 4 battery version of the squid DB mod. It has a decent sized black and white screen and a dial adjustment that also acts as the fire button sticking out from the side. It’s also voltage adjust only no wattage mod or other fancy modes. Overall i felt like this mod was designed to be simple and pair with their titan RTA which was the point of it so well done there. Now let’s get into some data. I ran my normal testing. I used Sony VTC5A batteries for the testing. Testing resistances were done at .12, .16, and .21 ohms. It’s a Voltage adjust only mod so Voltage points were max (8.4), 6, 4, 2, and 1 (minimum voltage). At .12 ohms it maxed out at 300 watts, 5.996 volts and 50 amps. For the rest of the testing it was never off by more than .104 volts and as close as .003 volts to the setting. Very accurate with no struggle. At .16 it maxed out at 310 watts and 7.048 Volts. Again very accurate it was .206V high at the 6V test but the rest were the same as the the .12 ohm test so very accurate again but slightly high. For the .21 test it maxed out at 321 watts and 8.205V. Again really good but a little on the high side With the 6V or higher setting (.205v and .206v) but under that the same as the other tests. Overall I felt the performance of this mod was really good. It never really struggled and is mostly slightly high .052v to .206v with it hitting higher more on the higher volt settings (above 6). I was able to get 321 watts max, so I consider it to be accurately rated at 300 watts and a little underrated. Their manual doesn’t list a max volt limit, the mod can go up to 8.4v on the settings implying no boost circuit but due to the efficiency of the chip and having 4 batteries in parallel/series the sag is minimal and i was able to get 8.205 with a .21 ohm coil which was over 300 watts so no issue there and well done. They list an amp limit on this mod of 60A. The most i got was 50 with a .12 ohm coil which is still one of the highest available today and much needed with the .06 ohm minimum resistance which would allow 150 watts at that low of a resistance. Personally If i was listing the specs I’d call the mod 320 watts, 8.2V and 50A. So overall not bad listings except the amp limit which i feel is slightly overstated but not too crazy. 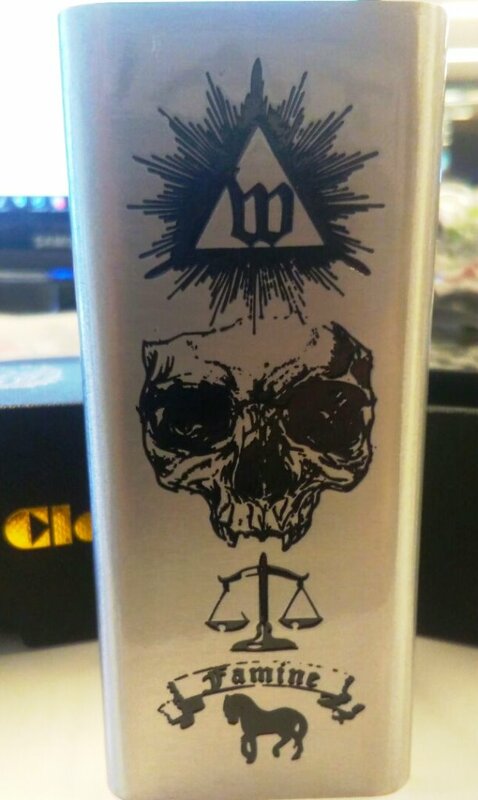 This mod is made to fill a niche of high watts and low resistance builds and massive tanks and really just nails it. The mod never got warm when stressing it at all. Even when i was chain vaping the titan 41mm RTA at 180ish watts the mod handled it great. The mod also has no noticeable fire delay. You can get the full 300+ watts between a .12 ohm and .21 ohm coil as well and maybe even a wider range slightly. Also impressive is the minimum 1.052v i got. Many VV mods like this have high minimum volt limits. Some as high as 3.6V which means really low resistance coils have a high minimum wattage the mod can put out. This is not an issue on this mod. Another thing worth noting is this is not a PWM mod as the name suggest. It’s a VV mod so no different form any other regulated mod on the market except that it adjust by volts only and not watts. It’s basically a 4 battery version of the squid DB mod but with volt adjustment instead of watt adjustment or a 4 battery ijoy zenith with a screen instead of a pot. Mod performance is really good. Mostly hits slightly high. Accurately rated for watts (321), High amp limit of 50 but falls short of the 60A listed. Max Volts Tested 8.2v with a .21 ohm coil. Not PWM, is just a VV mod with a screen. The mod uses a standard 5 click to turn it off or on. There is no menu system or other modes or preheats. You can use 3 clicks to lock your voltage. Outside of that you just rotate the dial to adjust voltage. The screen shows a live wattage output while in use as well. And individual battery monitors for each pair of series batteries. The Steamcrave Titan PWM Mod adjusts by .1 volt increments and is very fast and easy to adjust. The mod itself is built solid with no rattle at all, and has a good solid weight to it without feeling heavy. The Battery door is a fully removable bottom plate like the hog V3 mech so i’m not a big fan of that as it needs to clip into one side then be pushed to lock into place. I felt that could be better done but it does have reverse polarity protection in case you screw up and place them in wrong. It’s easy to get batteries in and out without damaging wraps though and takes 4 18650 batteries. The paint on it looks nice overall and has shown no signs of wear on me and matches the matte black titan RTA very well. The fire button is nice and clicky and a good size dial on the side but if you did dare to pocket this behemoth of a mod it can catch on your pockets. It works well though and It never gets stuck or anything which is as it should be and is really comfy to use. The 510 pin gave me no issues and every atomizer i used on it worked great with no gaps. It doesn't look like much on the outside but inside it’s quite nice, secured from the inside and properly grounded with a thick load wire as well. All the soldering looked nice and well built. The mod handles a 41mm atomizer flush and the mod itself is flat on top with no platform. The screen is decent size black and white screen that is nice and bright and easy to see. It’s not the best but since many mods like this don’t have a screen at all it’s not a big deal. Also for branding the mod itself has just the steam crave logo engraved in the front in matching color and the right side on the bottom has titan pwm mod engraved on the bottom and the back has in a white color what appears to be a serial number. There is no USB or charging on this mod at all however there is a hidden USB on the chip if you unscrew the top. I don’t see plans for firmware upgrades or mention of it so i don’t believe it does anything on this mod for users. not actually a PWM mod as labeled. Just a standard VV mod. So with all that said, do I recommend this mod or not? I don’t like to do a hard yes or no and this one i have to lean towards the yes. There is literally no competition i’m aware of as it stands for this mod in vaping i’m aware of. There hasn’t been a quad battery mod since the F4 which is discontinued and that was the only other one that took a 41mm atomizer without overhang. If you want a quad battery mod these days especially one that handles a 41mm atomizer this one runs unopposed. It also helps that it performs great and comes through on its promises. I’ve added this mod to my sheet of recs linked down below.